Emma, a childhood friend of Priscilla’s, (and family friend still today) was working on illustrations for a book ‘Lily Fabourama Glamourama’ the night of Priscilla’s accident. Emma was determined that one day she would work out how to best contribute to the work of the Foundation. ‘Priscilla Fabourama Glamourama’ is that contribution. Emma is an award winning author and publisher, teacher and speaker. She has been teaching the craft of writing and illustrating to children for the last twelve years via the Child Writes program, a process whereby children are supported through the entire process of creating their own picture book, from the conception of the idea, through the writing and illustration process, to book launch and beyond. For five years the ‘Child Writes Library’ (now 360 titles) ‘flew’ with JETSTAR as part of their inflight entertainment programming, and all are available via Amazon. Her passion is developing a business with the principle focus of empowering others to navigate their world through storytelling, She is a regular guest on ABC Southern Queensland Radio with host Belinda Sander talking about books, and if she isn’t consuming them, she is writing them! Her latest project is with a 12-year-old illustrator, creating a book about child depression. Emma is also the founder of ‘International Read to ME! Day’, a campaign focused on the importance of reading regularly to children. 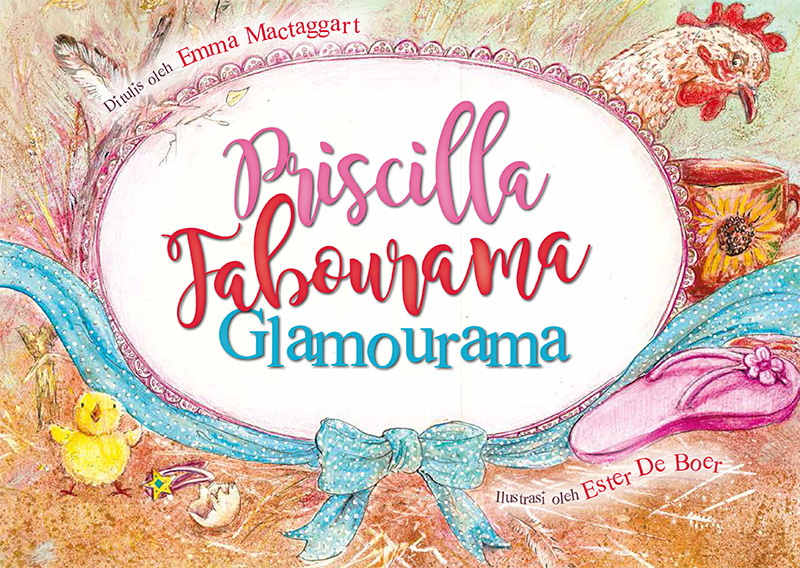 ‘Priscilla Fabourama Glamourama’ (2018) is ‘Lily Fabourama Glamourama’ (2004) reimagined with amazing new illustrations from Ester De Boer and translated into Bahasa. The original incarnation of the book won a silver medal in 2015 for ‘Best Illustrated Children’s eBook’ in the Independent Publishers Awards (the IPPY’s) in New York, USA. It was translated by Orchie Ochie DeMeulenaere, School Director, Yayasan Cinta Bahasa Indonesia in Ubud. Whilst published by Boogie Books (Emma’s publishing business) it has been wholly gifted to The Priscilla Hall Foundation, with the intention of (a) promoting the Foundation, (b) to possibly raise money for the Foundation and (c) because Priscilla truly was a fabourama glamourama. We hope you enjoy reading ‘Priscilla Fabourama Glamourama’ as much as we did!